How you helped me redesign the site. For a long time, I was happy with the old JobMob look, or JobMob v1. My friend Fitore had helped me with the original design, and I thought she did a great job, as I mentioned on the Credits page. I liked the soft gradient of the logo – trendy back then in 2007 – and the color highlights against a minimalist white & blue layout. And I received mostly compliments during the first few years (if you're a designer, you're probably snickering by now) as the site grew and became popular. In late 2010, I hired a project manager to evolve JobMob into a membership site, and it became clear very quickly that the new project could only succeed if the original design was heavily reworked or replaced entirely. However, that project was frozen a few months later, and the original design survived. In late 2012, I began working on a new job search-oriented Internet startup. Early on, I met Efrat Ben Yehuda, a Tel Aviv-based User Experience (UX) and Usability Expert. Among other things, I hired her to audit JobMob v1's design and her report convinced me that sooner than later, JobMob had to be modernized. Our startup was frozen in Spring 2014 and the next logical step was to think more seriously about JobMob's future again. The turning point came when Bartek Miszkiel of the Emske creative studio reached out to me last September. 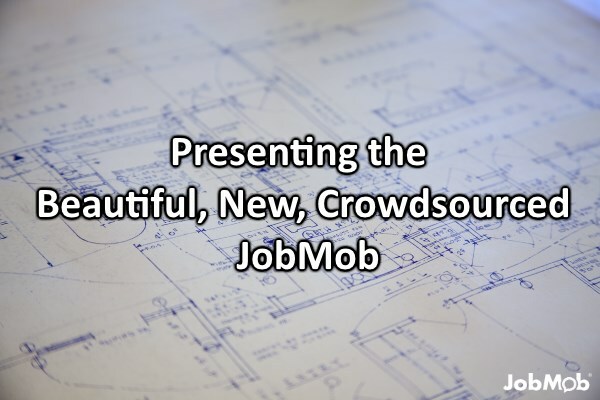 A likable guy, we quickly came to an arrangement where they would design a new JobMob logo. But I didn't just want a new logo; I wanted a logo that you and the rest of the JobMob community would have a stake in. Which logo concept do you like best? In this design our main assumptions are: simplicity, professionalism, reference to the current logo and little dose of humour. The logo is simple with the bubble being ‘mobbed’ between the “M” and “b” letters. First of all, I really enjoyed the design process, both with Emske, you, other designers and non-designers who gave feedback. I wanted a logo that might be different but still had a recognizable connection to its earlier cousin. It had to be a logo that was simple, but also clever, and Emske delivered with the comment bubble-in-a-bubble, signifying discussions. Emske also surprised me with something unexpected. They conceived the new JobMob logo using the Golden Ratio (Φ), which I learned in high school as the Golden Section, the “divine proportion” that occurs frequently in nature and has been copied often in art (Salvador Dalí), architecture (the Parthenon) and so much more. Other logos that follow it include Apple, Twitter and Pepsi. My plan was to use the logo to set the tone for an eventual JobMob redesign. Although the final logo wasn't yet complete when we rang in 2015, the voting gave me a clear direction. I researched WordPress theme trends, recent design best practices, the free vs. premium theme debate, and more. Inspiration also came from websites such as 8JGBC sponsor Quicksprout.com and Videofruit's blog. I wanted a theme that was simple and clean yet flexible, lightweight and fast yet with certain features built-in so I would need fewer code customizations and plugins. I later decided that paid support was important too because even if I have the tech skills to fix any eventual issues myself, I didn't want unforeseen circumstances to force me to lose focus on whatever project I'm working on when they happen. After testing over a dozen themes from almost as many theme directories and vendors, I settled on the Schema theme from MyThemeShop as the base for JobMob v2. Although it only took a few minutes to download and install, I spent a few days playing around with it while being a heavy support forums visitor – where reps would respond within hours – until I was truly happy with the final result. JobMob now uses classic web technologies that it didn't even have before, such as threaded comments. Woohoo! And with others planned, I've already added one major new feature that you can try out, but more details on that soon. What do you think of the JobMob redesign? What's good and what could be better? Tell us in the comments. I think the separation in between of articles is missing in the new theme. Just see the animated image you included in the end of the post. It does not have to be a horizontal line like before, but I can imagine the box with little shadow which is already there but includes all the articles to be divided into more boxes, one per article. The new design is beautiful! Congratulations and good luck! Good suggestion. I just made the change.